Man and beast have been fascinated by the rolling motion since recorded history. The wheel is said to have been invented 4,000 BC in Mesopotamia (as with all history debateable because the Chinese also claim it). When was the spherical ball first used? Indeed, whether spherical, cylindrical or egg-shaped, large or small, regular bounce or irregular bounce, in every shape and form the rolling and bouncing ball has held mammals and most living things in infinite fascination. Kittens and puppies will happily harass a sphere for hours and beetles roll dung into a ball and trundle off home with it. Man has invented a battery of engineering uses and for entertainment has invented an endless number of competitive games. At the tender age of 15 months my grandson Gabriel primarily calls for his “ballee” and attempts to kick it. Egyptian monuments show carvings of a type of ball game; the Chinese are reputed to have invented a game in which a cloth with a circular hole in the middle is hung between two poles and opposing teams have to kick or throw a round cloth ball through the hole. The ball is mentioned in the Odyssey and is known to have been popular in Ancient Greece although strangely enough there is no mention of a ball in Hebrew Scriptures. Whether kicked, thrown, carried, pummelled, pounded or prodded the ball remains ever-popular today and hence the Roman invention of the game of “bocce”, known throughout the world by various names and practiced by many nationalities in their own peculiar ways although the normally standard feature is that of a marker ball around which various sized balls have to be thrown, the aim being the winner launches a ball that rests nearest to the marker. In Italian the game is still called “bocce”, which is bowls or lawn bowls in Britain, petanque in France and popularised in the United States through mechanised ten-pin bowling. 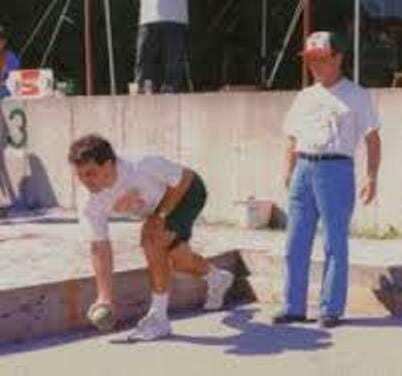 Malta has a game known as “bocci”, a natural corruption from nearby Italy and played very much on the same lines as “bocce” and petanque. It is vastly popular throughout Malta and Gozo with most towns and villages having their own sanded “bocci” area with participating teams taking part in keen competitions administered by the Malta “Bocci” Association on games that very much on the same lines as petanque. It is mainly a male preserve because there are no female teams. During my boyhood, the game was also highly active but not organised and was played as street entertainment. Most roads were not asphalted but were rocky and rough-hewn and made the artistry and accuracy of the game that much more difficult. In the Maltese version there is a small black marker ball normally the size of a large marble. Opposing teams, made up of three or more players, have a set number of balls some of which are spherical (roughly the size of a smallish tennis ball) and a set of larger and heavier cylindrical bowls with rounded edges. One team’s set is red and the other green or blue. The smaller balls are used to target the vicinity of the marker, the larger cylindrical versions are the “destroyers” used to dislodge the opposing team’s smaller balls that are nearest the marker. They may be used underarm but may also be rolled or lobbed. However, a “destroyer” also counts if it is judged to be nearest the marker. A set number of points first to be achieved within a set number of frames by either team are declared to be the winner. Distances are measured with lengths of string and rival contestation can evolve into heated argument and the necessity of a neutral referee. Most clubs have their own refreshment area serving beer, alcohol, soft drinks, ice creams and snacks and are a popular late afternoon magnet in summer when matches are played. The Bugibba Bocci Club draws many tourists in this tourist area – mainly British – who watch in fascination a game that resembles but is not their own version of bowls. In the mornings they are encouraged to “have a go” for a small fee and the air is rent with female “ooohs” and “aaahs” particularly when they try to lob the larger cylindrical bowls. On one occasion I saw one lady lob the bowl and it ended up behind her! I have never played the game but I used to accompany my uncle Edwin for games played in a rocky field. I was ten years old and took an instant liking for the marker. In one particular game a heated argument ensued and whilst the adults were vehemently distracted in debating the distances, I swiftly picked up the marker and pocketed it. When the players returned there were gasps of astonishment because the marker had vanished into thin air. An intensive search of the rocky field followed (in which I actively and “innocently” participated) but of course the marker was not found. The conclusion was that during the heat of the matter somebody must have accidentally kicked the marker into some nearby shrubs and it was declared “lost”. I kept it for a few weeks and then not having any use for it, I threw it away! The bowls used to be made of wood but nowadays may also be plastic and the game requires skill and graft with players refining their skills according to the bowl they use with “destroyers” playing the more spectacular role.